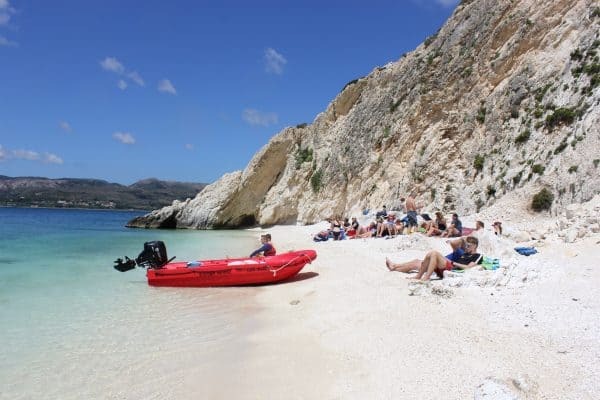 As part of your sailing holiday in Greece we offer amazing day excursions using the dinghies from our Lixouri Bay Beach Club in Kefalonia. It’s kind of like Swallows and Amazons but without the raincoats. 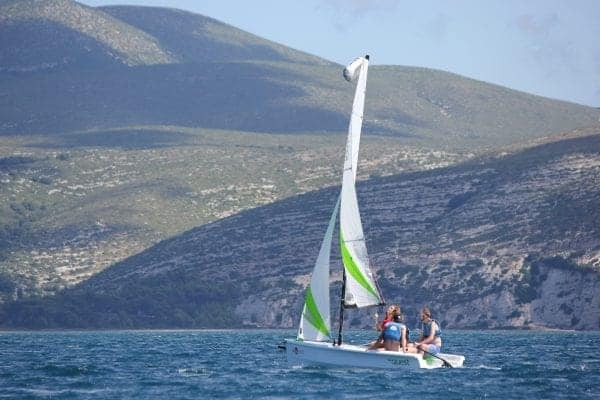 Set the sails on our fleet of brand new RS dinghies and after a leisurely hop across the Ionian bay discover the hidden cove known as “Pirates Bay”. Throw in a support boat, some friendly beach staff and an ice box stuffed full of cold drinks and you may well have found the highlight of your beach club sailing holiday in Greece. Head for the beach, that’s where it all happens. 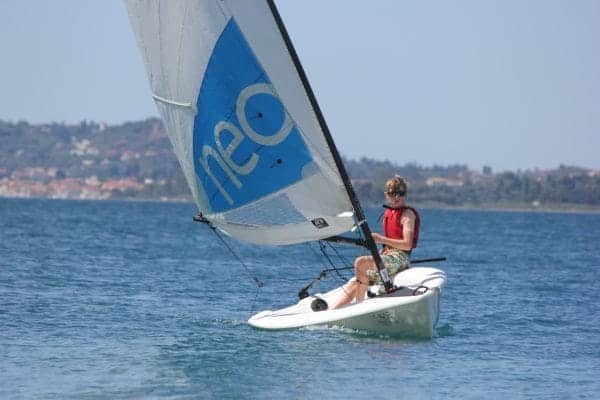 Lots of brand new dinghies, Catamarans, Sups and Kayaks to choose from, all inclusive and all part of your Active Sailing Holiday in Kefalonia. You will then join up with the beach club sailing team at the beach shack, where they will give you a full introduction and the sailing briefing for the day. After this grab some refreshments, pop them into our cool box and get yourself ready for a morning of fun on-the-water activities at the secret beach. Time to go sailing, just grab the dinghy you signed up for! With the light morning winds, it generally takes a bit of beating up wind. Some people like to race to the beach, but most are happy to cruise along and enjoy the views. It doesn’t get much better than this…seriously. Crystal clear water and the whitest of white sand. 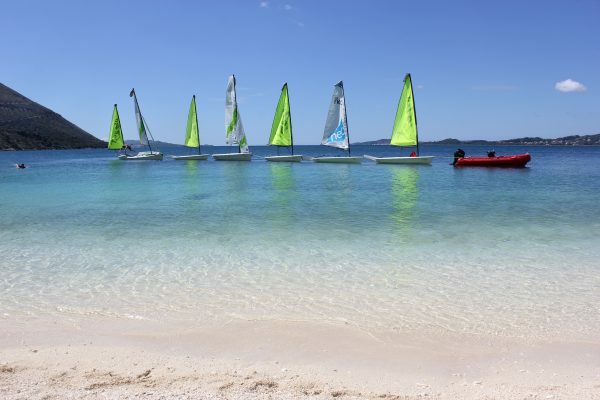 As the beach is only accessible by dinghy, you can enjoy the peace and quiet. Grab a cold one and hang out at this secluded Greek beach. The beach is sheltered from the elements, so perfect for a quick snorkel and a swim before lunch. After spending a good hour on the beach relaxing as hard as we can, they’ll be a quick blast back to the beach club. The sails fill with the fresh early afternoon breeze, getting you back in time for a giant Greek salad and a cold beer around the pool. Which beach club for Sail Away? 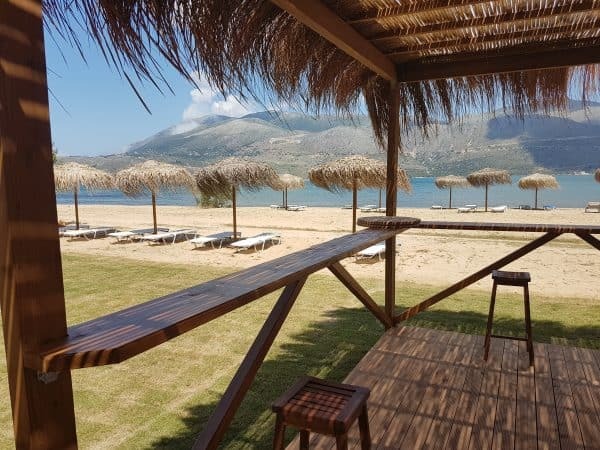 Currently we run the sail away from Lixouri Bay Beach club. We have the perfect bay to sail to called Lovers Bay. At Paliki Beach Club we do a paddle board excursion down the coast to a local cafe where you can enjoy sipping on an ice cold frappe. Fancy Exploring more secret beaches? Charter our Day Yacht!